Two years on WordPress! – I'm Here; Right Here. Yes, you got it right. Spot on. I survived for two prolonged years on WordPress. And you heard me right! Let’s get started with a Thank You as per the regulations say. A “Thank You” note from the bottom of my heart to every soul that has ever read even a word of me. I honestly respect you for bearing and being with me all this long. I would be really glad if I could mention all those names who have personally reviewed or commented on my blogs. But, you have really nothing to do with all those. So, I won’t take much of your time. Right? Right it is then! Honestly speaking, before writing this post I had made up my mind that this would be my last blog post and I’d bury this blog to an entirety. But, as I progressed with paragraphs after paragraphs, I was stuck with the thought that there’s a lot more to be poured out of my mind and heart, for the world to witness. Writing is what angels do to whatever we do or think in each of the smallest of moments in our lives. Writing is what Prophet Muhammad did to Quran that has been creating differences in over 2 billion lives for over 1400 years now. And moreover, writing is what Allah has done to our Fate. Each moment, each breath. So, how can writing be ordinary ever? See, I totally understand that this thought would have never crossed your mind and heart, and at no point of time in this world, and at least not in this manner. And there were a lot of other things I never said. I never said it. But, it’s all lingering in my brain. Allah orders us to do so. Or else He says He shall punish us for not doing these things in life. That’show important being a noble human being is to Allah. But, what’s so strange about it? Right? I had never seen in my a person of different religion than Islam going to a stranger of the same religion and telling him that we should be nice to people, be worthy human beings, stay away from sins. Then why hasn’t any other writer or blogger said the words of wisdom till date that overpowers or even matches any single verse of Quran? Because Quran and Islam is not just a book and a code of conduct. It’s a way of living. Then, covering one’s body with hijab, or niqab, or abaya; and one’s body shape and face with loose attires and beard, can also be a part of one’s style of living. And this very style of living is called “Sunnah” of Prophet Muhammad Sal’lal’lahu_alaihi_wa’sal’lam. This is how he lived and taught his companions to live. And after they embraced this kind of living is when Allah gave them successes in this world and the world Hereafter. I always had these things in my mind. I always wanted to write. Always. But, just not now. And this assures that I am going to write and write and write until when every stroke of my pen or the keypad asks my permission to heal the pain within my fingers until I change my life and any single others’ along the way. And for that to happen, I first have to reach a place where people would listen from. So, I promise you today, years from now, I won’t be signing my books to gain affection from people, I would write a personal note to every single soul I’d touch with my book and I’ll raise them above the matters of life and death. Its always great to see new and extraordinary perspectives on daily ordinary things. I’d never thought about writing in this manner. Thanks for bringing it up, and so perfectly. Keep on shining, human. Ohh my. Lool who’s here! Let’s just say ‘I’m good at it. Seems-like’. For nominating me as well as loving those 3 facts. Nice how you explained writing is not ordinary. Ah! Ya. It just crossed while writing this post. I’ve been doing photography, but just didn’t get the time to post something. Do post them soon. I’m already ready with my comments. Al’hamdulil’lah Nice to hear from such a profound writer. Congratulations on 2 years of this year. 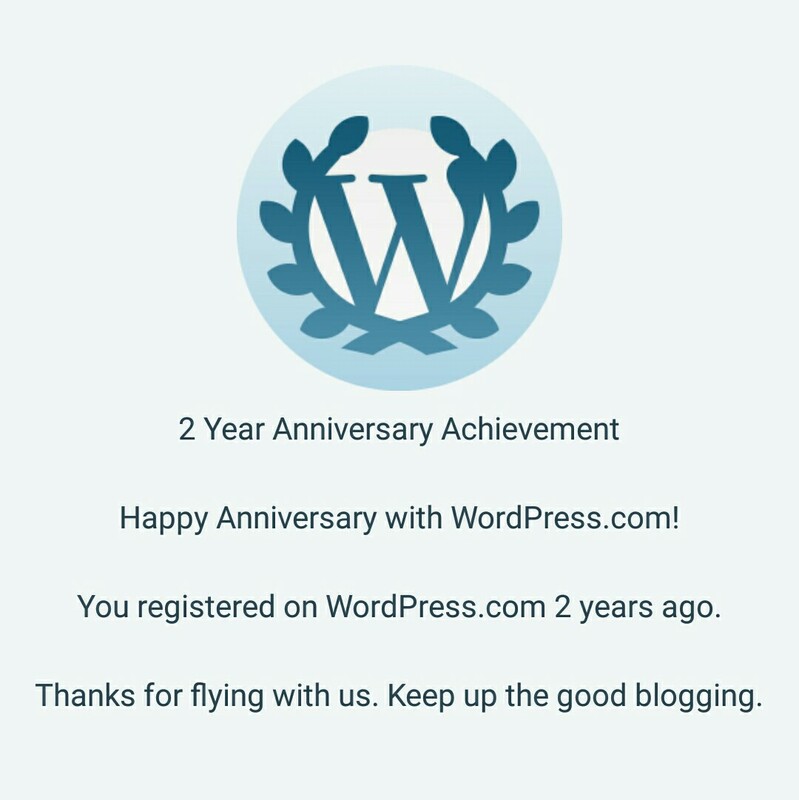 I celebrated my 2nd blog anniversary yesterday. Oh so congratulations to you too. Hoping you like my blog too. It’s an intense delight to hear that.